The Sandwich Generation refers to the group of adults who care for their parents while supporting children of their own. This is a concept that most people are familiar with, but don’t realize actually has a formal name. If you are here, there’s a decent chance you are a member of the Sandwich Generation, or will be in the future. And while being sandwiched or squeezed seems to have a negative connotation, it doesn’t necessarily need to. In much of the rest of the world, and especially the developing world, it’s just a part of life. As your parents age, they’ll move in with their kids and everyone will live out their lives together. Said differently, the Sandwich Generation, for the majority of the world, is a normal part of life. At the same time, having three generations living together under one roof isn’t the typical family situation here. And it certainly isn’t portrayed that way on TV. Although we didn’t always know it was called the Sandwich Generation, we always knew we’d eventually be a part of it. After our father passed away when we were seven years old, we saw our mom struggle financially. It was clear we’d need to help her. We started helping her financially when we were old enough to work. Fortunately, we were able to get incredible scholarships and financial aid awards to go to college. But upon starting to work after college, we began to help our mom financially again. Nothing too crazy. Just helping pay for the utilities here and there when she was low on funds, since her earnings are lumpy. Camilo helped her cover her car payments. But as the years passed, and we saw our mom struggle to save for retirement, we knew we’d need to step up eventually unless we wanted to see our mom work until her last days, or even be homeless. For us, that’s not really an option. We wouldn’t let that happen, and luckily, we are in a position to not let it happen. Some people will read this and say “it’s not your problem to deal with” or “your mom should have saved for the future”. The reality is much more complicated. Our mom sacrificed everything to bring us to the U.S. when we were four years old. She made sure there was always food on the table. Made sure we always had a ride to soccer practice. She often works 18 hour days and devoted her life to helping others. When she’s no longer able or willing to work, we aren’t going to be willing to let her live on the street or in a shelter. She is an incredible mother to us and her guidance and support has changed our lives for the better. But just because we want to make sure she doesn’t suffer doesn’t mean we don’t feel the weight on our shoulders. We feel it. On top of this, culture also plays a role. For example, Pew research finds that Hispanic adults are more likely to be supporting both an aging parent and a child. According to their data, 21% of Hispanic individuals provide financial support to the generation above AND below them. This is in contrast to 8% for Black individuals and 5% for White individuals. Interestingly, there is no significant differences across income or educational groups. Originally from Colombia, we feel this first-hand. There, children stay at home with their parents until the day they get married. Their parents then move in with them when they can no longer live on their own. The families are extremely tight knit. It’s a beautiful part of our culture. But it can clash with the ideals of the American dream. In an ideal world, your parents will prosper financially and eventually leave the world without relying on your financial support. Many even dream of being able to leave a financial legacy to help their future generations. That’s actually one of the things that drove us to master personal finance. We wanted to be in a position to help our children, and eventually grandchildren. But we’d be lying if we said we wouldn’t want them to help care for us (even if not financially) when we are no longer able to care for ourselves. Clearly, the situation with our mom isn’t ideal from a financial standpoint. But we aren’t alone. The Pew Research Center reports that in 2012, 15% of adults in the U.S. were members of the Sandwich Generation. In the years since their study, we are certain that the numbers have risen by a lot. Making matters worse, research shows that it is getting harder for young adults to earn more than their parents. Those born in the 1950s had a 70% chance of earning more than their parents. For those born in the 1980s, the figure drops to 50%. This means that many parents are continuing to provide financial support to their adult children. In fact, Pew research finds that more people provide financial support to their adult children than their aging parents. Trying to stay afloat financially isn’t always easy. 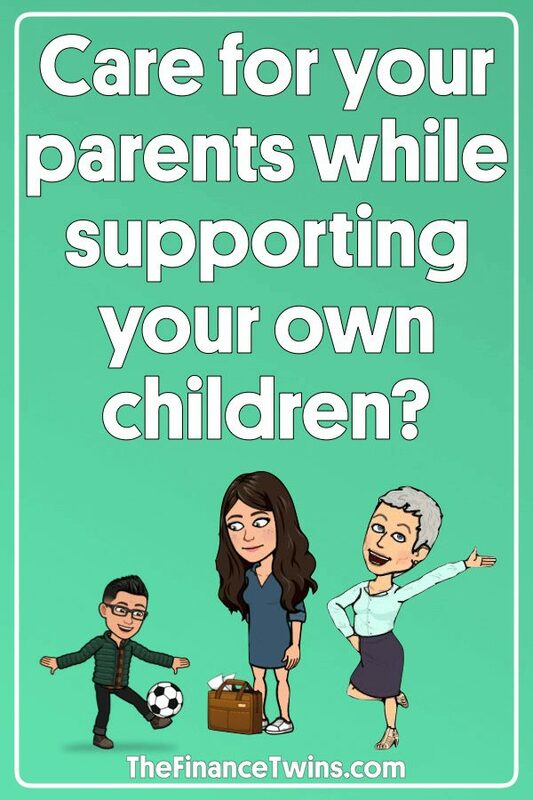 If it were that easy, your parents wouldn’t need financial help. And while it can be scary to think about the long-term cost of caring for a parent, it’s necessary to know what you are up against. For starters, my mom is fortunate that she has three kids who want to help take care of her. And my siblings and I are lucky to have each other to help share the responsibility. But while this helps, taking care of an aging parent is still costly. And how much it costs will depend on many factors. There are also benefits associated with having everyone under one roof. The extra time and memories you can build together are priceless. And if your own children are young, they get an extra set of mentors at home, as well as responsible caregivers. In addition to the everyday expenses of meals and other ordinary expenses, you may incur additional costs. For example. if you end up having to pay for remodeling expenses for your home, this can easily reach the tens of thousands. Remember, that you may need to make the home accessible for wheelchair access. If you need a home health aide, the daily rate can range from $120 to $200 per day. If you provide the care yourself, it may mean lost hours at work. And none of this include medical expenses, which seem to be limitless. How Should You Budget For Caring For Aging Parents? While we aren’t sure exactly how much to set aside for future expenses, we know we’d rather start saving now instead of waiting for the bills to pile up. Having a monthly budget is critical for this. Use our detailed step-by-step guide to budgeting get started. For that reason, our recommendation is to set aside a regular amount each month. As an example, if the three of us are able to save $100 a month and set it aside, that’ll mean that we can collectively save $3,600 annually. If we do that for 10 years, we have $36,000 saved. And that doesn’t include any investment growth or appreciation. No, it’s not a fortune, but it would go a long way to cover daily expenses and meals. More importantly, it gives us peace of mind knowing that my mom will have our support when she needs it. She’s the rock of our family, and we want to be there for her. If you are already a member of the Sandwich Generation, or think you will be, there are a few things you can do to prepare. For starters, you need to get on the same page with your spouse, siblings, and their corresponding spouses. Don’t wait to discuss what you’re each able and willing to contribute until it’s time to do it. If your parents will eventually move in with one of you, it’s important to discuss this with each other and your parents. Maybe your parents already have their own plans or desires, so it needs to be a team effort. The conversations might not be easy to have, but they are important. Try to maintain your parent’s sense of dignity, because they will never admit how hard it can be to feel like they aren’t self-sufficient. I am sure it isn’t easy. Second, try to make a plan. Things change and it’s impossible to know what will happen in the future, but if you don’t plan for the inevitable, it’ll make things harder in the future. 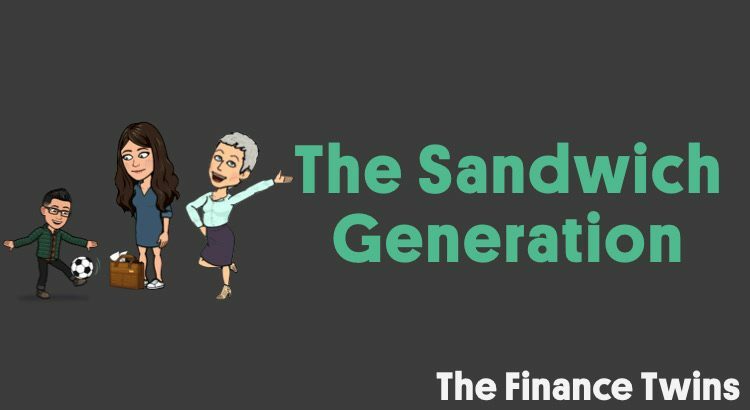 Being a part of the Sandwich Generation doesn’t have to define you or your finances. But you need to get organized and make sure you have you money under control. Make a budget, stick to it, and save for your future. Lastly, remember you aren’t alone in being part of the Sandwich Generation. People have been taking care of their parents and their kids for hundreds of years around the world and they have been fine. You will be too. Yes, it might mean that you can’t retire when you’re 35 years old, but that’s okay. Many things are more important than money. And for us, family is everything. This is sobering. We have an account for our dog’s end of life care but nothing set aside for my mom. Scary. Drew! Thanks so much for reading! Great article, and great advice. My family is also Hispanic, and as you say, it is very common for the children to care for their aging parents and for them to live together once the parents retire. My husband is White, so he doesn’t understand the Hispanic mindset in regards to aging parents…I’ll need to sit down with him and have “the talk” with him as you suggest. I’m hoping my parents retire in Mexico so that I can more easily fund their retirements. Hi Ani! Thanks again for reading and sharing! We think it’s very important to have the talk with your husband, so I am glad you are planning to do so. I am sure he will understand when you explain it. My dad immigrated from Dominican Republic and also worked unforgiving jobs like your mom to give me the best he could. He has 9 kids, and when he retires next year we’ll each give a monthly contribution to make sure his bills are well taken care of. He never knew how to invest for retirement 🙁 I completely understand and relate to you twins and your third sibling! It’s quite the plight! We need more voices to share their story so thanks for sharing yours!!! Thank you so much for taking the time to read. We agree with you! It’s a story that is more common than people realize. And it will only become more common as the baby boomers continue to age. Hi Finance Twins, I’m living that exact situation, raising school age children and having my mom live with us. I’m Latina, my husband is American and very supportive. A few thoughts: having an emergency fund as you are doing is a great start and gives you flexibility. We opted not to have long-term care or pay her bills directly because we felt we would eventually need to have her with us and a bigger house gave us the most flexibility while preserving capital. She’s healthy and independent at age 80. Another option we considered would have been to buy her a home, but we figured she’d eventually need to live with someone. Plus, this allowed us to continue to be able to fund 529’s for our kids as having her with us required the least amount of cash flow to be redirected. Our kids, her well being and our financial situation all had to be taken into consideration and I find there is usually more than one option. It’s worked well for us. Good luck and thanks for all your work on the blog! Thank you so much for sharing your story and what has worked for you. You do a perfect job of highlighting how every situation is unique and there isn’t a 1-size-fits-all answer when you’re a part of the sandwich generation. 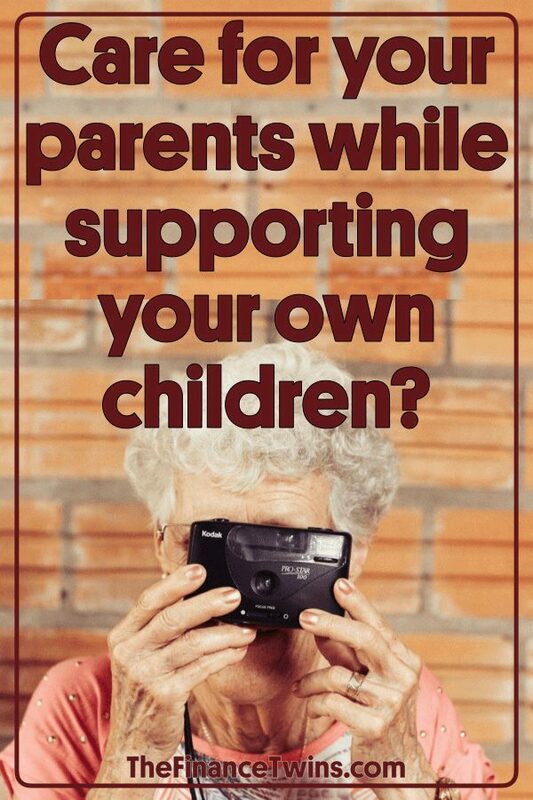 – Keep in mind that “caring for your parents” doesn’t necessarily mean handing over a check. My grandmother had plenty of money, but she needed rides to the grocery store and the doctor, and she needed help with heavy cleaning (i.e, she couldn’t manage the vacuuming or pull sheets off her bed). Time and elbow grease matter just as much as money — and that may not be easy if it means taking time off work. – Look into community resources. The single best thing we had for our grandmother was Meals on Wheels. Five days a week someone came into her home and brought her lunch. The visit was just as important as the food — that probably kept her in her own home for two extra years. We also have transportation for the elderly (or handicapped); it’s free, but you must schedule 24 hours in advance. – Find out what your elderly relative’s insurance will pay. My grandmother’s insurance paid for a weekly visit from a home health nurse; so once a week she had her vital signs checked and had a CNA who helped her with things like trimming/painting her nails — all in her own home. These home health nurses can help with bathing or hair washing, can do shopping or simple meal prep (i.e., cutting up veggies and storing them in the fridge), or help with physical therapy “homework”. Sometimes it’s easier for an elderly person to ask a non-family member to do things like help with bathing or trimming toenails. The one thing home health cannot do: Give medicine. They can count out pills into a day-of-the-week container, pour a glass of water, but they cannot give it to the elderly person. – Smartest thing we did for my grandmother: We were fortunate that my grandmother had so many children /grandchildren, and everyone was willing to give. When it became apparent that it was time for us to start giving back, we had a family meeting, and we all laid out what we could do … when we could help with driving, things we could not do, etc. Everyone gave. AND, though it wasn’t a pleasant task, we developed an “Emergency Plan” for the day when things went badly. Face it, the day will come. Your elderly loved one will fall down, will be diagnosed with a disease, or will have some other problem. So we agreed upon a plan: She’d go to her son’s house, and we all agreed upon specific things we could do to help lighten her load — and his load. My mother agreed to do all the doctor-appointment driving, I agreed to provide meals several times a week, my brother agreed to take care of her house while she was away, my sis-in-law (who works in insurance) agreed to take primary responsibility for navigating her medical bills. As you can guess, the emergency did happen — it was a stroke — and it was easier because we all knew our instructions. Another thing that helped: My mother bought a notebook and kept records of all her doctor appointments /instructions in that notebook. My grandmother was inclined to “make light of” what the doc said — but when it was written in the notebook, which we could all read, it was harder for her to ignore the doc’s advice. Wow, this is information EVERYONE needs to know. Thank you so much for sharing it and for reading. We mean it!